Good quality fencing is built to last, but its life-span can so easily be shortened by rotten fence posts. A good, sturdy fence panel can be damaged beyond repair if the post rots and breaks off in a strong wind. Even treated wood posts will eventually rot once they’re sunk into the ground, but Postsaver fence posts sleeves will dramatically increase their life-span and save you money. 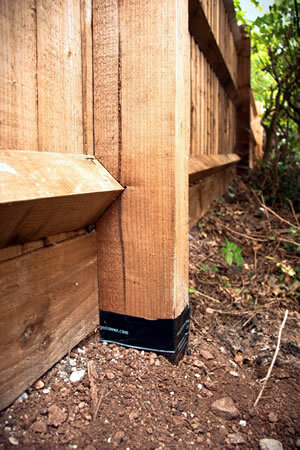 Fence post sleeves are a low-cost way to protect the vulnerable section of post that’s below the ground-line. The sleeve is applied to the post very quickly and easily prior to being put into the ground, and it’s then maintenance and hassle free, with no ongoing costs. The non-toxic sleeve keeps moisture, oxygen and decaying organisms at bay, and can potentially double the fence post’s durability compared to a post without a sleeve. Trentwood Fencing recommends fitting Postsaver sleeves to fence and gate posts, a very reputable brand which guarantees their product for 20 years. The sleeves have been independently tested to meet European Standard EN252 and BSI Standard ENV807, among others. Wooden gate posts can also benefit from fence post sleeves in exactly the same way. Ask Trentwood Fencing about using protective Postsaver sleeves with your fence or gate posts prior to installation.